Besides cash, check or money orders, you have three other methods to pay your electric bill. Call for more information on these programs. Even Pay (Budget Billing) — Federated's Even Pay program allows you to pay your electric bill in consistent payments. It eliminates the high and low bills associated with winter heating and summer cooling. Sign up is available during the months of April, May, August and September and requires enrollment in the Auto Pay program. See brochure for more details. Auto Pay — Sign up to have your monthly bill automatically deducted from your checking or savings account on the due date. never worry about late payments or finding a stamp again! Click here for a brochure. Credit cards — Charge it! Use your Visa, Master Card or Discover Card over the phone, through our website with Online Pay or at our Jackson office. Online Pay — Step up to your computer or phone instead of stepping out to your mailbox. 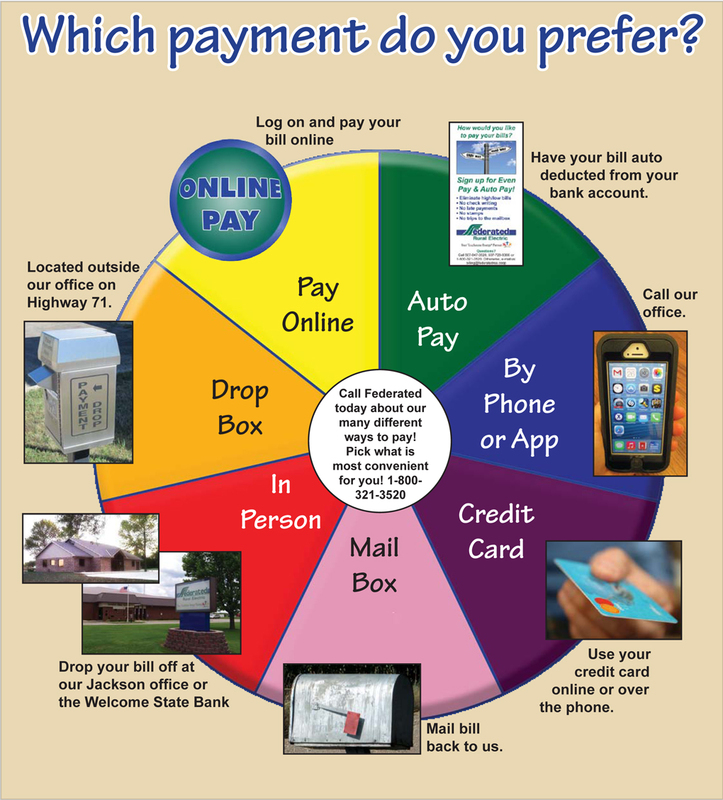 Use Federated REA's new online payment service. All bills have a pre-printed return envelope that may be used to return your payment to Federated. If you lose or prefer not to use the return envelope, you may mail your payment to Federated Rural Electric, PO Box 69, Jackson, MN 56143-0069. Members who would like to personally pay Federated may do so at our headquarters located 1 mile south of Jackson on Highway 71 between 8 AM and 4:30 PM, Monday through Friday (77100 US Highway 71, Jackson MN 56143). A drive-up payment drop box is also available at this location. The Welcome State Bank (111 N Guide St, Welcome MN 56181) also accepts members' payment of Federated bills. Any bill received after its due date will be assessed a late payment penalty (three percent).